For fashion, even war is no excuse to let standards slip, as many British women found out during WW2. As part of doing their part for King and Country, they were strongly encouraged to contribute to the war effort by looking their best at all times. In fact, one bit of British war propaganda was literally “Beauty is your duty”… As you might imagine, this led to some rather ingenious solutions to solve the inevitable shortages of cosmetics and clothing that arose as a result of wartime rationing. On that note, clothing in UK began being rationed in June of 1941, about a year after provisions were put in place to ration food. Under the rules of rationing, every person in the UK was initially given 66 coupons which they could exchange for clothing. Different items of clothing carried a different coupon weight decided by the time and material that went into making them. So, for example, you might need to exchange eleven coupons for a dress, but only two for a pair of stockings. Each year, the allocation of coupons would be replenished, though the amount steadily decreased over time, with adults only receiving 24 between September of 1945 and April of 1946, for instance. Exceptions to this general rule included children (who were allotted 10 extra coupons to account for rapid growth) and new mothers (who were given 50 extra coupons to buy things like baby clothes and blankets). Again, these amounts changed throughout the war to reflect the ever growing scarcity of supplies. It’s important to point out here that most at this time did not have closets and dressers bursting with clothing as is common today thanks to a much more industrialized and global clothing industry. Thus, people generally had far fewer garments to begin with, and now even more limited ability to buy replacements. This all led to the “Make Do and Mend” campaign, which was pushed hard by the British Ministry of Information, demonstrating a variety of ways in which to make clothes last, such as to buy bigger clothing than needed for children so they had room to grow. They also illustrated techniques aimed towards modifying and repairing clothing using various atypical materials. (More on this in a bit.) They even setup classes to teach basic seamstress skills, though many women of this era were already quite good at this. Unfortunately for those who couldn’t afford the more expensive clothing, this meant either sticking with clothes that were already well-worn, or using precious coupons on clothing or materials that were low quality, and thus didn’t last. This all created a major problem that needed solved pronto if women were to continue looking their best- something deemed important for the country’s morale. To solve the issue, the government actually did something somewhat innovative for once, which would ultimately have repercussions on fashion and clothing in the UK long after the war- they created what was dubbed “Utility clothing” in 1942. Essentially, Utility clothing was mass-manufactured clothing produced in a limited range of styles, fashions and colors to minimize production costs over how clothing up until that point was commonly made in the UK. Importantly, beyond driving the costs down, a second goal of this fashion line was to make the clothing extremely durable. With clothing lasting longer for everyone, this also ensured more materials, factories, and workers in future would be available for the war effort instead of making clothes for civilians. But making it cheap and durable wasn’t enough. After all, the overarching goal was, for women particularly, to look good. Thus, the government managed a trifecta by enlisting the aid of the Incorporated Society of London Fashion Designers to provide the nation’s best in the field to oversee the designs for both men and women’s Utility clothing. As a result of this foresight, Utility clothing actually became something of a hit with the public and many of the designs would probably still be considered fashionable today, because things like conservative dark suits, tapered dresses and black plimsolls never really go out of style. In fact, they even made a relatively fashionable air raid outfit known as a “siren suit”; so if a woman needed to jump out of bed and flee to a bomb shelter, while possibly literally having bombs raining down on her, she’d look damn good while running for her life. This all brings us to makeup. Unlike most everything else during WW2, makeup and cosmetics were never rationed during the war, instead being subjected to a massive luxury tax which was levied upon all items deemed “non-essential” by the government. On this note, amusingly, many cosmetic brands continued to put out adverts despite the fact that the stock of the very things they were advertising for were low to non-existent. So why’d they do it? In essence, it’s generally thought they were afraid if women got used to not wearing makeup, when the war was over, some might just not go back to it. So the companies did everything in their power to push women to continue to find ways to wear some form of makeup. Paradoxically, this meant they continued to advertise a product that it was impossible for many women to obtain, right next to full page ads telling them if they didn’t wear it, they were letting Hitler win. In fact, when Hitler came to power, he established a German Fashion Board (Deutsches Modeamt) to help push his brand of fashion, emphasizing, among other things, no make-up, natural hair, and curves, rather than the “boyish bodies” that Parisian fashion promoted. Important to the discussion at hand was that the end goal, according to Hitler, was that “Berlin women must become the best dressed in Europe”. So what was a patriotic, Nazi hating British woman about town to do when she wanted to stick it to Hitler, but didn’t have the coupons (or money) to afford a new dress, and nobody in town had cosmetics available? In short, she improvised. Women would make new clothing out of everything from curtains or furniture upholstery to old parachutes, and would raid their wardrobes to reuse, mend and alter their existing outfits to make them more stylish. 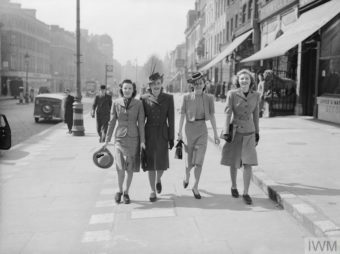 The lack of materials also allowed women to be a little more risque in their clothing choices and the hemlines of dresses became noticeably shorter during the war as a result. This, however, caused a problem of another sort- exposed bare skin, with no good way to partially cover it thanks to a shortage of stockings and the relatively newly invented nylon being unavailable owing to almost exclusively being used by the military. To get around the problem, women began staining their legs with various things, including gravy browning, to make it look as though they were wearing something, even drawing a seam down the back of their legs to complete the effect. With the government seeing to it that, “every government poster recruiting a land girl, image of a Wren or member of the Women’s Royal Voluntary Service showed her with bright red lipstick and a flash of black mascara”, the clothing problem wasn’t the only thing that needed solved. To get around their lack of lipstick, women would dye their lips with beetroot and, somewhat questionably from an eye-health standpoint, use boot polish as makeshift mascara. They would also shove flowers and other herbs into their pockets to get around the lack of perfume. When Did People Start Shaving Different Parts of Their Bodies? How did WW2 change the way people dressed?